The Upper Middle Rhine Valley in Germany, between Bingen, Rüdesheim and Coblence, also know as the Valley of the Loreley, is one of Germany's most scenic and culturally beautiful regions. The picturesque panoramas, numerous medieval castles above small historic towns and steep vineyards along the Rhine River have inspired visitors for centuries. 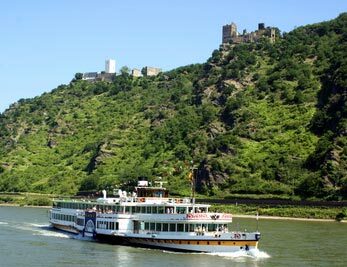 Experience the fascinating atmosphere along the Rhine River and enjoy the hospitality of the region. We offer a free shuttle service between the castle and the landing stages for our hotel guests. Hiking on one of the most beautiful hiking trails in Germany: The "Rheinsteig"
The Rheinsteig is one of Germany's most scenic hiking trails and runs right through the inner ward of Castle Liebenstein. From here you can hike along the Rhine River with astonishing views over the valley. We offer a special service for our hotel guests: Enjoy your hiking without luggage! As soon as you leave the castle in the morning your luggage will already be on its way to your next accommodation. This service is free for our hotel guests. 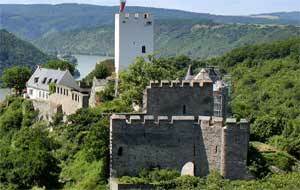 At the Middle Rhine River Valley in Germany you can trace the medieval age. At no other place in the world so many castles have been built in such short distance to each other. Beside the legendary Hostile Brothers, Castle Liebenstein and Caslte Sterrenberg, numerous other castles along the Rhine River are evidence for the importance of the region already in the medieval ages. For example you can visite the castle Marksburg in Braubach which is the best preserved caslte in Germany and just a 10 minute train ride or a short boat tour from Castle Liebenstein.